"When you look at your life, the greatest happinesses are family happinesses. " In September the Skarda/Rickards/Mellow family had a reunion. 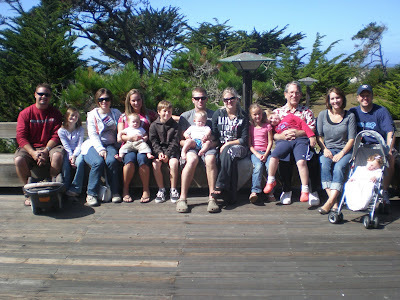 Although, we had so much together at Asilomar on the CA coast, the reunion was bitter sweet for us all. Not only was Sam away on his mission, but this was the first time we have all been together without Ronna. As cleche as it sounds, I could feel her with us all weekend. I saw the family threw her eyes and imagined how happy she must be to see her children, grand children, sister, nieces, husband and little boy all together and happily enjoying eachother for 2 wonderful days. I missed her hugs, her smile and seeing her in her pearls, not to mention watching her as a mother. I don't think I have ever seen anyone more gentle, patient, graceful & loving then she was with Skyler. Watching him play, I found myself remembering when she was pregnant with him and when he was born. Life is so confussing sometimes, but full of lessons. Thru the memory of Ronna I found myself slowing down and enjoying every little detail of life. Motherhood is so beautiful and such a gift, I don't want to take one minute of it for granted. 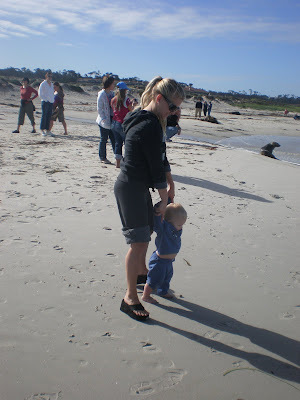 Dad & Ronna had visited Asilomar before and she had commented on how much she loved to go there. It was wonderful to be at a place that she loved with all of the people that she loved. On this side of the family, I am blessed to have 4 beautiful sister in laws, 4 wonderful brother in laws, 2 darling nephews & 3 gorgous nieces. 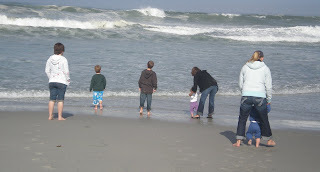 The older kids had so much fun playing in the waves, even thou it was freezing cold! They played together on the beach for a few hours! It is so neat how babies, kids & adults all love the sea & can enjoying it together and no one gets board! 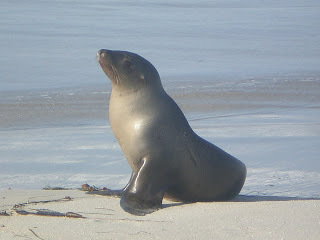 While we were at the beach, a seal came on to the shore. He was so cute and patient. He stayed the entire time and let us take pictures of him and tollorated all of the kids curiosity and excitment. 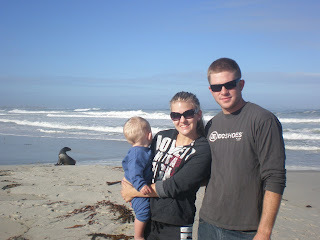 Here is Steve, Lunch Box & I near the seal. we did not want to get to close and scare it away. 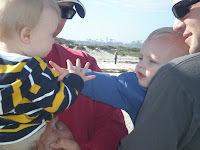 Here are my boys watching the waves together. 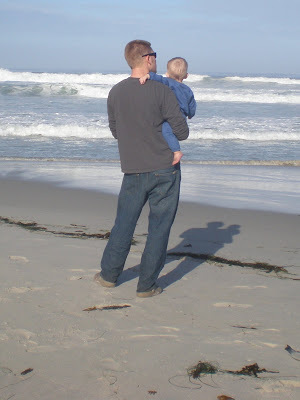 Steve LOVES the ocean and has talked about taking Griffin to see it since the day Griffin was born. Me & my darling son taking a walk on the beach. It was a wonderful vacation and I am so glad that we were all able to be there together & with Ronna in spirit. We all decided that we are going to do this 1-2 times a year, so the three of us are super excited about getting together again ASAP!!! I loved that post and your memories of Ronna. It sounds like we all had the same thing on our minds. Your pictures are beautiful! Will you email some to me? 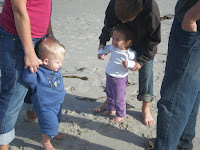 TaraM22@gmail.com You can go onto my blog and click on the link to our family pictures to download my pictures from Asilomar. I had so much fun getting to know you on that trip! We have to plan a get together soon!